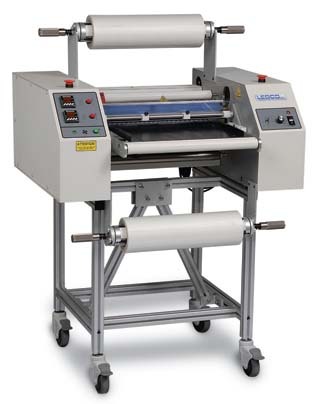 Ledco's 20" H20 Dual Hot Roll Heated Roller Laminator in 220volt is capable of 2-side and 1-side Laminating amd thermal Mounting up to 1/2" thick. Purchase includes metal floor stand with casters and now with 2 year warranty. The 20" Ledco H20 hot roll laminator has silicone rubber heated rollers for perfect non-friction scratch free laminating on 1 or 2 sides. The large 2-3/4" heated roller also make thermal mounting faster. Lamination pouches can also be used. Variable Speed: Max Mechanical Speed: 0 to 10 fpm. Rollers are spring-loaded and preset to ensure correct and even lamination pressure. Has gapable roller controls to make threading easier and allow even preheating.